During the first century B.C. the Chola Nadu of present Tamil Nadu was ruled by the Chola king "Uruva Pahtrer Ilamchet Chenni" (B.C.62-42) from his capital city the Uraiyur which was located earlier in the region of the present Thirutchirappalli district. He married the daughter of a Velir (Velaalar) king of Alunthur. After a period of reign of Chola country, he demised in the year B.C.42, while his son "Thirumaa Valavan" was still not born to his queen who was then pregnant. Irumpidarthalaiyaar who was the chief minister of Chola Nadu during the period of Ilamchet Chenni foresaw the threat to the life of the Queen of Ilamchet Chenni and her baby Prince still to be born - the next heir to the Chola throne, from the closest kin of the Queen from Alunthur who was aspiring to become the next Chola king. Irumpidarthalaiyaar took them secretly into exile and lived with them in safety. During this period the Queen gave birth to a son who was named as Thirumaavalavan and over a period of time he had reached his boyish age. The news of the existance of the legitimate Heir to the Chola throne living in exile and his whereabouts reached the closest kin of the Queen who was now ruling from Uraiyur as the new Velir king and sent his people to capture Thirumaavalavan and put him to death. He was captured and imprisoned in a camp which was set on fire by the agents of the Velir king. However the boy Prince escaped with some fire-burns on his legs along with the his mother (Ilamchet Chenni's Queen) with the assistance of his Uncle Irumpidarthalaiyaar, all of whom again went into hiding. During this period the Velir king who ruled from Uraiyur demised, and the Ministers at Uraiyur after collective decisions with other Minsters as per the traditions sent an elephant with flower garlends to go in search of a next successor to the Chola throne. 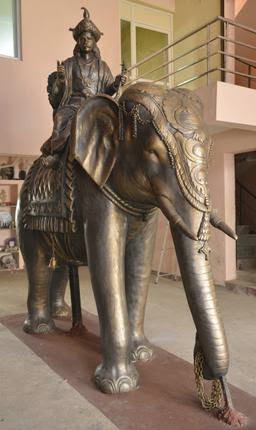 This elephant treaded from Uraiyur to Kalumalam where it reached the place where the young Prince, the Queen and Irumpidarthaliyaar were in hiding and garlanded the young Prince. The Ministers who were present at this instance with the disclosure of the truth by Irumpidaithalaiyaar that the Prince who was no other than the Prince Thirumaavalavan the legitimate son of the earlier Chola king "Uruva Pahtrer Ilamchet Chenni" and the legitimate successor to the Chola throne, escorted him to Uraiyur and crowned Thirumavalavan as the next Chola king with the royal title "Karikaal Cholan" (B.C.43-A.D.28) in the year B.C.43 by the Choliya Vellaaler..
Karikaal Cholan towards this time married the daughter of a Velir (Velaalar) king of Naangur. He had a son and daughter by her named Nalangkilli and Aathimanthi. He commenced his rule from Uraiyur under the royal name "Karikaal Cholan" (Valavan) (B.C.40-A.D.25). During this period Uraiyur has been the inland capital city while Poompuhar has been the seaport city of the Cholas. However Karikaal Cholan intended to build a new capital city and developed Kanchipuram or this purpose. 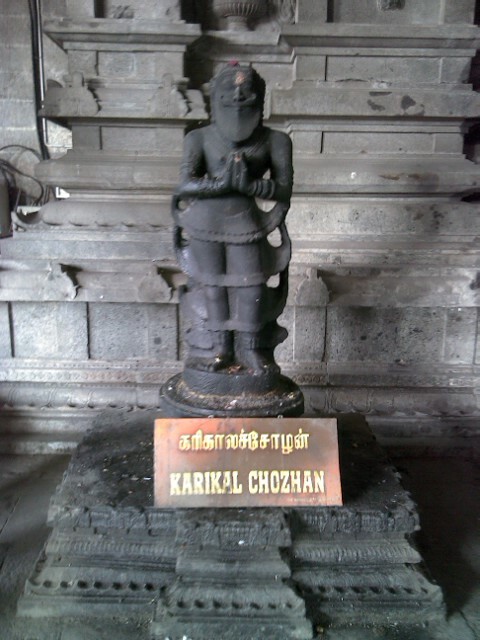 Karikaal Cholan however further wished to develop his Seaport capital to Poompuhar to have a greater control on the Trading Activities of Chola country with the countries in Indian mainland and countries overseas, and developed Poompuhar into a large new city and re-named it as "Kaviripoompattinam". Karikaal Cholan initially built a temple to God Siva named "Ekambareswarer Thirukkoyil" in his new capital city at Kanchipuram, Tamil Nadu. In this temple there exits in the first Thiruchchuttru a granite stone statue of the king Karikaal Cholan. One of the foremost four Tamil Saiva Saints of Tamil Nadu namely Saint "Thirugnanasampanthar" in his Thervarem has referred to the association of Karikaal Chola with Ekambareswarer temple as கண்ணுளார் கழலின் வெல்வார் கரிகாலனை நண்ணுவார் எழில் கொள் கச்சிநகர் ஏகம்பத் தண்ணல் ஆடுகின்ற வலங்காரமே. Further he also performed 'Veda Velvi' Rituals in his Palace in reverence to God along with his Queens. He initially contained the nine Tamil Chieftains (Kurunila Mannar) being his kith and kin by way of marriage ruling from Kaviripoompattinam of Chola Nadu in Tamil Nadu, and brought them under his full control after a battle at Vaakai paranthalai (Vaakai battlefield) in Tamil Nadu. With this battle the rule of Cholas was re-established at Kaviripoompattinam. During this period the Paandiyan King and Chera kings too not withstanding the growth of a new power in the Chola country jointly went to war with Karikaal Cholan which took place in a region known as Venni Paranthalai (Venni battlefield) in Tamil Nadu. After a bitter battle Karikaal Chola defeated them completely in which the Chera king Perum Cheralathan (B.C.60-20) - (contemporary of Karikaat Cholan) who ruled from the capital City 'Vanchi Nagar' (present Kodungallur), fell and commited suicide in captive unable to bear the disgrace. Thus the Paandiya Country and Chera country (present Kerala) too became tributaries to the Chola country. In the year B.C.43 Karikaal Cholan sent his forces to Sri Lanka under seven commanders each heading a battalion, and the combined forces with 7000 men defeated the ruling king Vaalakambahu and captured North Sri Lanka. Two of the Commanders returned to Chola country with the treasures befallen them. The remaining five Commanders were empowered to rule this region consecutively on behalf of Karikaal Chola with collected revenues being sent to Chola country. After fifteen years in B.C.28 king Vaalakambahu released North Sri Lanka from the grip of Chola Commanders under Karikaal Chola and reinstated his rule over same. Karikaal Cholan on seeing the river Kaveri overflowing during the rainy season and damaging the paddy and other crops causing heavy damage to the Farmers decided to build strong "Embankments" (கரை) on both sides of river Kaveri. Karikaal Cholan on witnessing the heavy flow of water in Kaveri river during rainy season and great part of which flowing direct into the sea without being made proper use of for agriculture and other purpose, decided to build a strong "Stone Dam" (கல்லணை) across the river and prevent absolute waste of the natures's gift, but to divert them into various land stretches of present Kaveri Delta region. It was during this period the great Karikaal Cholan built the Kallanai (Anicut of granite stone) over Kaveri River (at the present Thiruchiraappalli in Tamil Nadu). "......The purpose of the Kallanai was to divert the waters of the Kaveri across the fertile delta region for irrigation via canals and to its northern delta branch Kollidam/Coleroon. Down stream of the barrage, the river Kaveri splits into four streams known as Kollidam Aru, Kaviri, Vennaru and Puthu Aru. However, the flood waters can be allowed, by opening the barrage/anaicut gates, to pass through the other three delta branches also to join the sea. It is constructed from unhewn stone spanning the Kaviri and is 329m long, 20m wide and 5.4m high. The dam is still in excellent condition, and supplied a model to later engineers, including Sir Arthur Cotton's 19th-century dam across the Kollidam, the major tributary of the Kaveri. The area irrigated by the ancient irrigation network is about 69000acre. By the early 20th century, the irrigated area had been increased to about one million acres......."
1. To raise the water level of the "newly excavated high level canal (Kaveri River)" to the designed depth of the two downstream canals, "new Kaveri River" and "Vennar River"..
2. In order to surplus the extra water during the seasonal floods carried by the "newly excavated high level canal (Kaveri River)" back into the "original Kaveri River", or "Kollidam River", the monumental Kallanai was constructed out of the outburst of super technological expertise of the King Karikalan. 3. Enormous yields of this project were so abundant and beneficiary which induced the Sangam Tamil Poets to write and sing in fabulous style. ("Spilled over paddy grains themselves accumulated during harvests would suffice to feed the entire Kingdom of King Karikalan-Porunar Aatruppadai-special poem)......"
Karikaal Cholan became anxious in his territorial ambitions and marched toward the North India. He first captured the Vacchira country (region around present Varanasi engulfed in between the Son river in the east and south, and the confluence river of Jamuna and Ganga rivers forming the main Ganga river in the north within the present Bihar State - மாநீர் வேலி வச்சிர நன்னாட்டு). The King of the Vacchira country made a treaty with Karikaal Chola and presented him the Muththu Pandar. (Note: The commentator 'Adiyaarkku Nallaar' of Silappathikaram mentions that "Vacchira Naadu as Sonaikkarai" (meaning Vacchira Naadu on the banks of river Son - a tributary river of the main Ganga River). Karikaal Cholan then turned his attention towards the Kanva King Susharman (B.C.40 - 30) of the adjacent Magadha country and captured his kingdom (region around present Rajgir east of the river Son of the present south Bihar State). The King of Magadha country too made a treaty with Karikaal Cholan and at the battlefield he presented him with the structure of an Audience Hall. The first ruler of Kanva dynasty of Magadha kingdom was Vasudeva. He was succeeded by his son Bhumimitra. Bhumimitra ruled for fourteen years and was later succeeded by his son Narayana. Narayana ruled for twelve years. He was succeeded by his son Susharman who was the last king of Kanva dynasty. He first defeated the king of the Avanti country (region around present Ujjain of west Madhya Pradesh). The King of Avanti too came into treaty with Karikaal Cholan and gave as tribute his Kottra Panthal (Royal Pavillion) to him. (21) Extent of the Chola Empire under Karikaal Chola in the first century A.D.
Kaviripoompattinam of Tamil Nadu was a flourishing seaport city with many well designed mansions and streets where the affluents and rich resided. During the period of 'Emperor Augustus Caesar' (B.C.63-A.D.14) of the Roman empire - many Romans traders and others came-forth to Kaviripoompattinam from the Imperial Rome (the present Italy) and mingled and traded in local and imported products with the Tamil & Foreign traders from other countries for gold (coins) and barter trade. 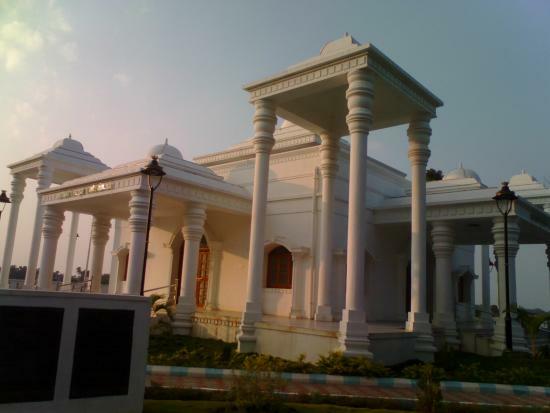 Many of them also resided in sky-high mansions in the city of Poompuhar (the Kaviripoompattinam). Kaviripoompattinam was also one of the cradles of the Sangam Period - Tamils and the Chola dynasty. The Muth-Thamil being the Tamil Poetical Works, Music, Dance and Dramatic forms flourished in this region. The Buddhism and Jainism too flourished along with Saivaism, Vaishnavaism and Vedism in this great capital city of Kaviripoompattinam. அவன் மகனாகிய கரிகாற் பெருவளத்தான் நாங்கூர் வேளிடை மகட்கோடலும்........."
and death to the Sankyadharas. himself the head of three kingdoms. ".......In that family took place the birth of Karikala Cholendra whose orders made the slopes of Himalayas the abode of Kubera (the Lord of riches); following whose orders the water-course of the river Kaveri, was controlled by the embankments (or Dam ??) on either side, and whose orders made the city of Kanchi full of palaces reaching the clouds......."
(V. 42.) In this (king’s) family was born he, the leader of all the lords of the earth, the foremost of the great on account of his virtues, the king who renovated (the town of) Kanchi with gold, who had established his glorious fame by constructing embankments of the Kaveri (river) and whom (people) called Kalikala because (he) was (the god of) death to the elephants (kari) (of his enemies) as also to the Kali (-age). களி இயல் யானைக் கரிகால் வளவ! Last edited by virarajendra; 19th November 2017 at 08:14 PM. Last edited by virarajendra; 18th November 2017 at 06:04 AM.